Interior Design is an art of influencing people’s lifestyle. This is a general statement that everyone of us is aware of. But when it comes to the Design of Interiors of an Office; the interiors play a major role in influencing their lifestyle and the employer’s work efficiency. Earlier in an article, “Exterior Design Vs Interior Design“; we discussed how each of their design is important in a way that influences a person’s lifestyle and how their correlation makes a difference. Before an interior designer commences work on an office project, he should try to understand the client, his taste, requirements, system of management, size and nature of staff, budget and other considerations. 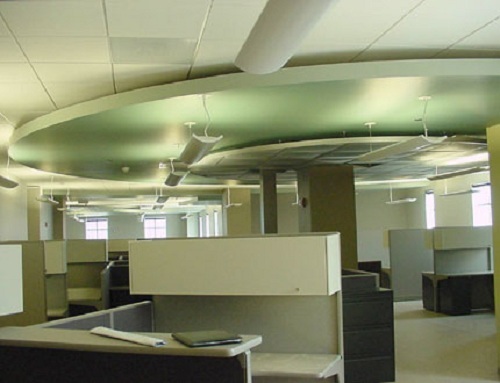 Then only the designer will be able to comprehend the dynamics of the particular office design. Offices have two specific area of design: One is general, shared by all the offices, like reception, work, filing, toilet areas, etc; other is particular, the individual requirements, like computer suite, plant room, cafeteria, etc. The designer should absorb the requirements of the client, principles of good office design, his own perception of an ideal office and then think of solutions. If he does not find some requirements of the client compatible with the perimeters of specific solutions he is arrived at, he should try to do away with such requirements with mutual discussion with the client. Here in this specific example, the original entrance was situated at one end and the entry to all the areas/rooms were through central corridor thus disturbing the quite of office all along the length. On the designer’s suggestion, the entrance was shifted to the middle of the building giving direct access from the central corridor only to a few rooms/areas resulting in some saving of space, end of disturbance, reduction in movement, and quicker mobility. The movement of visitors/staff is restricted and ensuing nuisance curtailed by situating many conference rooms near the entrance. But if a client has the noble intention of exhibiting his office to visitors, the above line of thinking would have to be thoroughly reversed. This will make you realise that there are no fixed rules in the field of interior design. This entry was posted by Benzu JK on September 24, 2010, 4:01 am and is filed under Design Guide. You can follow any responses to this entry through RSS 2.0.